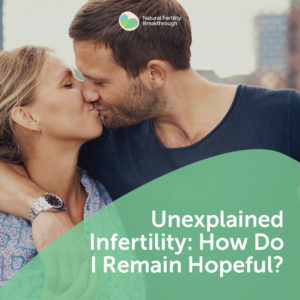 Home » Fertility Video » Unexplained Infertility: How Do I Remain Hopeful? Q: How do I remain hopeful even after the doctors tell me that egg donation is the only way forward for unexplained infertility? Unexplained infertility, in my opinion is a lazy way of diagnosing infertility. Truth is unexplained infertility should not be “unexplained” there are reasons why. I believe that when it comes to infertility and when it comes to keeping a healthy pregnancy to term, people need to investigate and understand the minor factors that may be getting in the way. Thorough investigation, it’s very much what we do for patients in our practice, to uncover and address all factors that are at play. Often it’s multiple reasons, a combination of multiple “minor factors” which makes it hard to have an exact diagnosis, but the fact is you want to make sure that you are looking at the situation from a much more in-depth perspective than, “this is explained, therefore, there’s nothing I can do about it.” That’s very much what we aim at changing during the Fertility Challenge. One of my patients, comes to mind immediately when I hear this type of question. She had multiple failed IVF attempts. She had been to 3 different doctors, and all of the doctors had told her to give up and use donor egg. She did the Natural Fertility Breakthrough Program, utilizing our 7 Step F.E.R.T.I.L.E. Method® We went systematically through every aspect of what needed to happen in order to give her the best possible chance of conception, even if it was going to be through IVF at the end of the day. By putting all of that in place, we were able to identify things that weren’t working and address them on a her biochemical level. It wasn’t a long time until that made enough of a difference that this woman actually was able to conceive naturally, after previous doctors had ruled out her chances to conceive her own biological child, with her own eggs. Now don’t get me wrong. There are times that donor egg is the best way and we support patients in our practice who also need to go down the donor egg path, but it’s a very different story knowing and understanding that this is the truth of what needs to happen especially when you’ve left no stone unturned along the way. Don’t just change strategies because you were told to. I think of another patient as I talk about this who before coming to our process, went and did donor egg and it failed multiple times. Then she went through our process returned to donor egg with the same partner, and she is now about to give birth. Hope comes from understanding that you have options yet to investigate, ways and means of addressing any number of “unexplained” factors that are getting in the way of taking home a healthy baby. It’s not necessarily that donor egg is or isn’t the answer. Focusing on the things that you can be grateful for is another wonderful way of retaining hope, understanding what you can be grateful for in your life, doing what it takes, taking charge, and working together as a team. That is the best way to give yourself the best possible chance. Here’s the link to download a copy of the video transcript How do I remain hopeful even after the-doctors tell me that egg donation is the only way forward for unexplained fertility? Register for the next free #Fertility Challenge an education and action based series of online events, and activities designed to guide and inspire couples who have been struggling to conceive and/or keep a healthy pregnancy to term and take home a healthy baby for over 2 years. This is a free, online event – so you can participate from wherever you are in the world. Join us here.